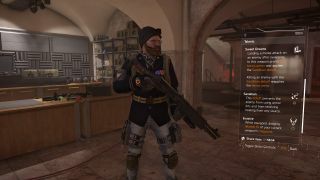 A guide to getting The Division 2's Sweet Dreams exotic shotgun. Exotics are the cream of the crop for The Division 2’s many weapons. The amount of effort put into gaining them is more than made up for by their unique talents, turning them into the focal-point for almost all endgame character builds. Sweet Dreams, the shotgun of the current exotics lineup, is no exception. A devastating force at close range, it might be difficult to fit into a build right now, but it’s definitely one you’ll want to have on hand as the metagame progresses over the coming updates. Equipped and unholstered, the eponymous Sweet Dreams talent allows melee attacks (the tab key by default) to reward a 35% bonus armour, and apply the Sandman debuff. Once that enemy is killed, the 35% armour is reapplied, partially negating the risk to your own health from rushing in to get that melee hit. The Sandman debuff is the core of Sweet Dreams’ abilities. It blocks an enemy from using any source of healing, and armour kits. Whether it’s hives, seeker mines, chem launchers, or anything else, none of them will have any impact on an enemy with Sandman applied. This is a particularly nasty debuff in PvP, where enemy players will more frequently rely on healing. The final talent is Evasive, which will reload 1% of your currently unholstered weapon’s magazine for each dodge roll performed. This doesn’t sound like much, but at the range where Sweet Dreams is effective, dodge rolling to avoid incoming fire and make yourself a harder target to shoot is vital. Put them all together, and the Sweet Dreams firmly cements your character as a close-range powerhouse. Charge in (using dodge rolls if possible for the reloading from Evasive), melee attack to apply Sandman and gain 35% armour, kill the enemy at point-blank with the shotgun, while they’re unable to heal, and reclaim any of that 35% armour you lost in the process through the Sweet Dreams talent. Of course, this play style is easily countered by riot foam chem launchers and anything that applies a shock property, so take those into account before rushing in. Using anything that blinds, shocks or disorientates the enemy will equally make getting so close to the enemy a lot safer, but you should always dodge to ensure you’re not stuck reloading unnecessarily. With a bit of luck and a pinch of skill, the enemy will be completely helpless to stop you. Getting a hold of Sweet Dreams is entirely luck-based, as it’s a random drop from any named Outcast boss. Whether they’re from bounties, stumbled across in the open-world, or encountered in any of the four main Outcast story missions, every Outcast boss has a miniscule chance of dropping the Sweet Dreams. Mine dropped from The Corpulent, the final boss of the Potomac Events Center mission. There are ways to increase your likelihood and make the grind shorter, though. The higher the difficulty, the higher the chance of an exotic drop, meaning playing through the shorter missions on Hard or Challenging is the best way to go. Also remember to play with three generous friends who are willing to trade you the Sweet Dreams should they get it, as that effectively quadruples your drop rate. There are two missions that seem to be the community-designated grinding spots. Both on hard or challenging difficulty, the first is Potomac Events Center, which is relatively short and includes two named bosses, The Owl and The Corpulent. The second is Roosevelt Island, the Outcast Stronghold, and its two bosses found approximately halfway through the mission, The Craven and The Basilisk. Unless you’re playing with friends that all agree to restart the mission after the two bosses, etiquette demands you stay until the end when playing in a group. This makes Roosevelt Island less than ideal for people running with a group of random players, as it means you’ll be wasting precious grinding time by playing the second half of a mission that’s intentionally more difficult than the others. For that reason, Potomac Events Center is recommended if you’re flying solo or braving random matchmaking. It’s shorter, less dense with enemies, and you’ll still get mission completion rewards if the bosses at the end don’t drop the Sweet Dreams. It’s a commiseration prize, but a prize nonetheless. Other than that, there isn’t any way to increase your chances of getting the Sweet Dreams. The Sweet Dreams isn’t as flashy as the Merciless or the Chatterbox, and it doesn’t fit as well into a single specialization as either of those two, but for the right build (especially when Gear Sets finally drop this week), it might be an incredible addition worth the time put into getting. And who am I to disagree?